I don't like smoking and i hate it more when people smoke inside a non-smoking area. I was supposed to extend my driver licence yesterday (since it expired on my birthday), but i forgot to extend it and today, i was going to Amplaz to extend it since there is a booth which can be used to extend it, but for my area, they are available only in Monday and Thursday. Another year has passed on my life and i'm now 27 years old now. I would like to thank all of my friends who have greeted me on Plurk, Facebook, and Twitters. I hope i have replied all of your messages and i haven't, please forgive me for that. I don't mean to ignore you. Tuesday is one of my busiest day in a week. I had three classes in a row and this week (and probably next week), i will have one full day without resting. Today, my first class ended in 10:28 AM and my next class started at 10:30 AM, which mean i didn't get any time to rest. My second class ended around 1:20 PM, and my third class started at 1:30 PM, which means i only had about 10 minutes to drank some waters or i would get dehidrated. I don't even have time to ate lunch. Starting this week and next week, there will be a lot of presentations coming up. Since the material has been completely delivered, it's now time to test how well they understand them by asking them to present their assignments for the last two weeks. I think it's a common way to test their understanding before going to the final test. Hopefully by analyzing their mistakes at their assignments, they can understand it better and do the right thing to fix it before facing their final exam which will be started at second week of May. Today is my girlfriend's birthday. I would like to congratulate her by writing this blog post to show how proud i am to be able to celebrate it again with her. MU has beaten Spurs at Old Trafford, which took them the top position on EPL for now and waiting for the results of Chelsea's match on Sunday. I was a little bit worried, as Wayne Rooney was not playing and some sources that i read reported that he might miss the rest of this season due to his injury. Berbatov, whom counted by many fans hasn't shown his capability for United for this season. Luckily, there's Nani who brought the enlightenment to United for this match. Two of the goals for United today was due to his work. He was fouled when rushing the ball into the penalty area to get a penalty which was executed perfectly by Ryan Giggs and he got a nice goal with his right foot to fool the keeper. 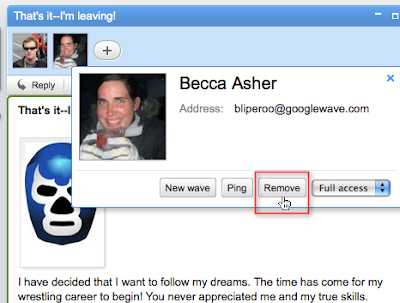 For some time, i have been wondering: "How do i remove unwanted participants on my Google Wave?". I can easily add participants, but not the way around (remove). Today is being celebrated as Earth Day. Google reported that it's being celebrated in more than 198 countries in the world. Google also do many things to celebrate Earth Day today. Check their blog for more detail about what have they done on today. It's posted by Austin Rachlin, Green Business Operations. Of course they managed to coordinate using their own technology such as Google Maps. Also, they managed to insert some announcement of what they have added on Google Finance last week (very good timing for some advertisement). In the past, i thought DES was very complicated, due to 16 rounds of processing, including a complex F function, but after preparing for giving lectures about Block Cipher, Feistel Cipher, and DES algorithm, i found it very easy to understand. Firefox 3.6.4 Beta is now ready to be tested by users. Why should you test this version? What interesting changes has been included in this release? The answer is Lorentz project which offers uninterrupted browsing for Windows and Linux users when a problem causes a crash in any Adobe Flash, Apple Quicktime or Microsoft Silverlight plugin instance. That day will soon be over with the release of Firefox 3.6.4 as it will give you a chance to will continue to run and users will be able to submit a crash report before reloading the page to try again. Google Chrome already had this feature, and soon Firefox will have it too. I'm not sure about this, but ever since i upgrade to Wine 1.1.43, Flashget has become more prone to crash or hang without any clear reason. Today, i deleted my .wine directory and reinstall old version of Flashget (new version don't work) and see whether it's working or not. If it doesn't work, then i guess i'll revert back to 1.1.42 which works fine on my desktop. Synaptics Inc has announced that they have bring Synaptics Gesture Suite™ to the Linux operating system environment. It's a good news for Linux users, mostly users running on Laptop or Netbooks, since they will have better support on gesture on their touchpad. Unfortunately, not all Linux distribution are supported. Currently, they only support Fedora, Millos Linpus, Red Flag, SLED 11 (SuSE), Ubuntu, and Xandros. SGS for Linux (SGS-L) supports a wide range of pointing enhancements and gestures including two-finger scrolling, PinchZoom, TwistRotate, PivotRotate™, three-finger flick, three-finger press, Momentum™, and ChiralScrolling. So far, some of them are already active on my ASUS UL80VT. I can do three finger down (yields a context menu), two finger scrolling and reverse (up/down and left/right). My colleague showed me an URL which links to an online store, here in Jogja that sells iPhone, iPod, and iPad. Yes, it also sells iPad. It's quite strange, since Apple itself hasn't have any plan to sell iPad in Indonesia. Even Telkomsel, Apple's partner who usually sold Apple's product hasn't even say anything about this. The 16 GB iPad is being sold at IDR 8.000.000 and 32 GB is at IDR 9.000.000. It's definitely much more expensive than the original price from Apple, but if Telkomsel will sell iPad in Indonesia in the future, the price won't be far from that also (i'd say around 6-8 million after tax). Do you want to have iPad? It's your chance to get it, but it's a little bit pricy. I can't be sure about their warranty, but check it out if you are interested. Google is planning to release their Google Chrome OS by the end of this year after they announced it last year. Many obstacles has been taken care by Google, such as speed, security, boot problems, and many more within the Chrome OS design. It's slick, fast, and should be stable due to Chrome's auto check during boot up and also auto update to make sure users gets the latest stable code to prevent unwanted threat on their netbooks. Even so, we have to understand that Google Chrome OS is just an operating system with only browser, Google Chrome. This raises a problem with connecting to some devices, such as printers. Each printers will have different drivers, unlike flash drive or hard drive or digital camera which usually works on USB ports. That's why Google is working on this and they have announced that they are working on an idea called Google Cloud Print. The idea how it will work in the future can be described in the screenshot below. Basically, it's like having a cloud access to any printer in the world (they must be accessible from the Internet). The job will be sent through Google Cloud Print technology, which they are trying to build right now. Basically, it's just another Google API projects, in which users can access the API and send the job information to the target printers. The API will take care the rest. You might ask, "how do Google connect to the current printers?". Good questions. They do need some kind of proxy installed on your computer so that your current printers (called legacy printers) can be accessed via Internet. This requires your desktop to be online 24 hours a day if you want to be able to use the printers, unless someone has started hacking to provide some small mini computers who have proxy support on it and it can be used to share the printers to the Internet. Google is now working with printer vendors to make their future printers support this feature, so they will start producing Cloud-Aware Printers, so no need to use special computer to provide proxy access to the printer. If you are curious about this feature, check Google Cloud Print Overview. John Russell, InnoDB documentation lead for MySQL has posted an article called Introduction to MySQL 5.5. This is probably first article about future releases of MySQL after it has been bought by Oracle. It is a good news, as many parties worries if Oracle would stop developing MySQL due to MySQL's position in the past being as Oracle's rival product. That's quite a lot for new features along with other bug fixes. Google has added another new handy feature on GMail. This time, they integrated Google Calendar and GMail by adding invitation link when you compose a message. It will open up a dialog just like the screenshot below and then you can start inviting your friends for your future activities. The friend list will be taken from your TO/CC/BCC list. Since last night, my Linux repository is not updating. When i checked the source repository, it didn't update also. They have some kind of lock in their status page, meaning there was some maintenance process or something else that caused the packages didn't get updated. So, i switched to other source of repository and i have downloaded all the packages (around 4 GB). This morning, i boot up my Ubuntu 10.04 Beta 2 and found that it has a mismatch checksums . I decided to go back to the original source and to know that i have to download around 6,8 GB. I just don't get it. Even though it shares the same repository, but it doesn't sync with each others. Or is it the changes in last night update was that big? I have two WDC (Western Digital) portable hard disks. My first portable HD has 160 GB and the other one has 500 GB. My 500 GB hard disk is now running low on free spaces, so i'm planning to buy another one, but i'm going to look for 1 TB instead of 640 GB. Unfortunately, there's no 1 TB for passport essential series. 1 TB is only available on passport essential SE or elements portable SE, which is not so portable as it's bigger than essential version. It's still too expensive for me, as it will cost around USD 199.99. It's been few years since i have committed to use only Linux on my computers. Nowadays, i'm always running on Slackware-Current on all of my work computers (1 laptop, 1 desktop, and 1 workstation). My old laptop is running Ubuntu Lucid 10.04 Beta 2 since i'm using it for testing purpose. My desktop does have Windows XP installed, but i have never boot into Windows for the last 5 months (probably more). Right now, i'm getting more comfortable with Linux and i think i can start abandoning Windows for my daily activities. I don't play games and so far, games are one of the main reason why users still installs Windows on their computer. The other reason perhaps drivers. Well, so far, i don't have too much problems with drivers. Most recent Linux distributions have a good hardware detection, thanks to the community who developed the Linux Kernel along with Linus Torvalds. Looking for support? I think the community has better support than asking for official support from Microsoft. Sometimes you have to pay for fast response and the result may not be as fast as the community in Open Source environment. Take a look in LinuxQuestions or probably LaunchPad. They are two example of a very active community, helping others and shares their solutions to those who have problems. With more and more vendors joined the Open Source community and Linux Foundation, more and more devices and applications gets ported to Linux and in the end, Linux will become more mature than ever and more and more users will migrate to Linux. I do feel that Linux is getting better and better each day. So, why don't you try to start using Linux from now? Still not sure? Take a look on Why Linux is Better. Some colleagues and my students asked me to add Karmic to the repository as they still use Karmic and a little bit hesitate to migrate to Lucid when it's released. They have modified their desktop so much and they can't take any risk of losing it again (meaning they would have to download all of them again). So for the last few days, i have been adding Karmic to the repository for i386 and amd64 architecture. It was totally huge and it took about three days to fully rsync with uplink mirror that i use. I started the rsync script at night so that it won't slow down the other at peak time and normal days, so the progress is very slow. Not only that, the Lucid repository keeps changing each days, with new packages introduced, rebuild packages, and many more. The changes keeps going on. So finally tonight, i shall have finished the Karmic and Lucid repository and both of them has been updated to the latest update from the mirror. From this point, next update should be smaller as it will only get the changes from the current position. After Apple released their iPad, many other vendors prepared to release their own product that soon will be a rival to Apple's iPad. Google for example, is preparing to release their own product, which is rumored to be GPad and it's running Google Chrome OS. The video is already posted on Youtube by Glen Murphy, one of Google's Chrome OS designers. Another contender comes from WePad, designed by a German company. It's really designed to be an iPad killer, since it has 11.6-inch screen, definitely bigger than iPad's 9.7-inc, powered by an Intel chip and relies on a Linux software basis which is compatible with Google's Android and all Flash applications, something that Apple doesn't have (especially Flash, in which their battle is going hot and hotter howadays). It's also said that WePad users are not required to install specific application to put their files on the WePad, unlike Apple with iTunes. Since it's Linux-based, it should be compatible with all operating systems available. This is surely strike Apple since Apple is well known of their iTunes as a gateway to their products. Today i spent almost half of my day at work. I have three classes to teach and one thesis (final project for Bachelor degree) presentation. Unlucky me, the schedule for the thesis presentation was at 3 PM where i have to teach at 1.30 - 4. PM. Usually, i would have skipped the presentation, but the student whom present her final project is my supervised student, so i must attend it. Gladly, the presentation ended nicely. She passed the presentation even though some revision still have to be done in order to get her final score. After that, i visited my girlfriend's sister because she has just got her first daughter yesterday. The baby was so cute and the parent was fine. I visited there with my mother and after that, i had a dinner in Pizza Hut with my mother and my girlfriend who came to the hospital about 30 minutes after i arrived. It seems that Mint users are not as much as i thought, so after some consideration, i deleted the Linux Mint repository. After all, the repository is very small, as most of Linux Mint's packages are taken from Ubuntu Karmic Koala, so i guess it's better to have Karmic's repository, so it can be used by Linux Mint users and also Ubuntu 9.10 (Karmic) users. So few hours ago, i started to modify the rsync script to add Karmic repository for i386 and amd64 architecture. I don't know how much space is needed to add this repository, but i'm hoping that it will be finished by tomorrow morning. Just came from LKML and spotted an interesting threat which become one of the hottest message on LKML. Check it out. Another repository has been added to my campus Linux repository. I have just finished mirroring Linux Mint repository. Why Linux Mint? Because it's one of the best Linux distribution which works out of the box and it has very good reputation on hardware detection. Aside from the distribution, it probably being used by some students in my campus, so it would be better to support them if they are going to use it. There is another repository coming up, which is Fedora, but i'm still waiting for the next major release, Fedora 13.0 which will be released next month. I will start mirroring when the release date is near and the repository is ready to be downloaded. Right now, they are still lurking at testing directory and not quite ready for production. I will only mirror production-ready release (Except for Slackware-Current and Slackware64-Current). I have downloaded the latest Ubuntu 10.04 Beta 2 and install it on VMWare. Unlike the previous Beta, this version works and i can use it without any problem. The first beta couldn't finish the installation and the installer crashed during copying the files. My first impression about 10.04 is the speed. It loads very fast even on VMWare and i can get into login prompt in less than 5 seconds. If you enable auto login, you will get your desktop in less than 10 seconds. That's very nice of it. Another thing that is unique in 10.04 is the left-orientation of the window control buttons, such as close, minimize, and maximize button. It's like what we see in Mac OS X. It seems that Ubuntu designers have adopted Mac-like design. I hope users will not complain about this. About the application, it's pretty standards. You can't expect too much on 600 MB CD. I don't see GIMP on Beta 2, but it's still available on the repository, so you can just start fire up terminal and execute sudo apt-get install gimp to get it if you like. Yahoo is still being used as the default search engine in Firefox, even though Canonical developer has stated that in the final release they will revert back to Google. I have changed the repository to use my internal Linux Repository and so far it's good. It's working as expected and no problem so far. At first, i started to talk about Slackware since most of the audience has no idea about Slackware nor they haven't used Slackware. Next, i discussed about the difference between -Stable and -Current branch and also the difference between Slackware and other Linux distribution. Then some audience has started to ask and i answer them one by one. It was a nice discussion. The moderator went off around 00:00 AM and the discussion is no longer moderated. Everyone started to ask many things and it has become even more active discussion since other member also replied and share their answers and opinions. Another update today for my Linux repository. I have added Slackware64-13.0 and Slackware64-current, so basically all Slackware release starting from 12.2 and above are now available. Besides Slackware updates, i'm also setting up for new architecture for Ubuntu Lucid Lynx. Right now, it only support for i386, but i'm in a progress of downloading the amd64 version, so that 32 bit and 64 bit computers can make use of this repository. I'm also testing the new kubuntu on my vmware (currently, it's still installing at the time i wrote this blog post). It's Kubuntu 10.04 Beta 1 and i will try to update all the packages using the repo that i have created. For those who would like to sneak peak on the work i'm working on, you can contact repo (at) ukdw ac id for more information about the repository. Last night, i added Slackware64-current to my Linux repository. It's completed as the routing is now has been corrected, so it will have faster connection and using Telkom's bandwidth instead of Indosat. My internal Linux repository is now finished. I have finished the first phase, which was downloading the repository. My laptop can finally take some rest after four days downloading 30 GB non stop. Right now, i'm adding up Slackware64-Current to the repository. More repo will come, but please be patient. Everything will be disclosed someday when the testing is done. For now, it's already up and running, but still being tested internally. One of my student asked me about what kind of tools that can be used to create DFD (Data Flow Diagram) in Linux platform. I searched Google and i couldn't find a good tool on the first page, but on the second page, i saw a link to a product called Business Process Visual ARCHITECT which can be used to create DFD model. It also supports Linux format, which is very useful for me. It has two kind of format, install and no install mode. The second type will not create any shortcut nor modifying your system's setting. It will be launched from the directory where it holds the binary of the application itself. The size is quite big enough, around 140 MB each. I have just came back from Galeria Mall with my girlfriend after watching Class of the Titans at Empire XXI. At Galeria, she tried the fish theraphy near Toga Mas. On Monday, they offered 50% off and you get 30 minutes with only IDR 35.000. She was curious how it felt to be bit by lots of small fishes around your feet. I'll try to sum up the progress with my Ubuntu Repository project. So far, i have downloaded 15 GB of Ubuntu's Repository from Kambing using my old laptop which i formatted to Slackware 13.0 with minimum installation (no X, just text mode). It has been running for 1 day and 20 hours so far, probably the longest uptime i ever did for a laptop of mine. Usually, i never use laptop that long. As i stated before on my previous post, the complete Lucid repository will take 60 GB of space (and probably growing) and i'm not going to do that as i believe only a few people will take the advantage of the availability of the source code. They tends to use the binary instead of compiling it from source. That's why, i'm excluding the source on my repository and it's only for i386 architecture. Adding x86_64 architecture can be done later when the first phase is done and it's not a big problem as it won't be as big as the initial phase. By using this scheme, i managed to reduce the size of packages i need to download to around 30 GB. So far, i have finished around 50%. If you think it's very slow, yes, it's very slow, but i'm running it on my personal Internet connection based on Speedy's unlimited access with up to 1 Mbps connection. It would have been finished if i'm using my campus connection, but due to technical problem, i can't do that. On the first day, i managed to download around 9 GB (24 hours) and today, i'm hoping to get another 9 GB so i will have 18 GB around 3 PM (it was the time i started downloading the repository). It shall be finished on Tuesday or Wednesday, depending on the stability of the connection. Today, Apple officially released IPad, their newest product in their Apple Store. As usual, people lining up to get their hand on the product. They even willing to sleep outside the Apple Store to get it. Having Apple products is like a miracle and believe it or not, it makes other people starring at you for some time, making you like a celebrity instantly. Today, i browsed some sites and then i saw LiVES, a video editing tool system for Linux platform. This is the application i have been searching for some time. I have tried to compile and install other applications, but most of them failed due to unsatisfied dependencies. This application does have lots of dependencies, but in the end, i managed to install this after fulfilling all the dependencies from Slackbuilds project and now it's running very well on my desktop. Right now, i'm trying to build a Ubuntu repository for my campus. It's a challenging task, as i have never tried this before. I am able to create Slackware repository since it can be done using a script or plain rsync command, but in Ubuntu, the situation is not that simple. It has so many parameter which should be set, unlike Slackware, which only need one parameter (the version). At first, i used apt-mirror, but it's not customizeable enough so in the end i abandon them. Next, i asked the maintainer of Kambing, one of the biggest online repository in Indonesia and he told me about debmirror. I tried to use this and yes, it's very customizeable. I can download only the selected architecture, something that is not yet supported in other application i tried before. It saves so many spaces, since the repository itself is very huge. A full Lucid repository would take approximately 60 GB and by filtering the packages to selected ones, i can reduce it to around 30 GB. That's 50% reduction which is very nice efforts. Firefox 3.6.2 was proven breakable in the Pwn2Own contest, but the problem is now fixed with the release of Firefox 3.6.3 just now. The detail of the problem can be seen in Mozilla's advisory or in their BugZilla. This year, there has been two events that is celebrated on one day. The first one was Chinese New Year and Valentine day. Today, another two event are celebrated in the same day: Maundy Thursday and April Fool. Talking about April Fool, as usual, Google dominated this day with so many jokes. Check the entries at Wikipedia. Will there be another multiple events in the same day in the rest of this year? We will see about that.